A checked version of this page, approved on 19 March 2012, was based on this revision. This article will examine the evidence for Qur'anic geocentric cosmology. Some may confuse geocentricism with the the idea that the Earth is flat. This is not the case. These are two different ideas. 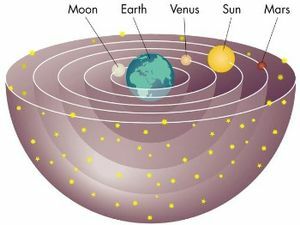 Geocentrism simply is the notion that the earth is the (immovable) centre of our universe, thus all celestial bodies mover around it. The ancient Greeks and the Europeans of the middle ages thought that the celestial bodies (the sun, the moon and the 5 known planets) all moved in celestial spheres around a spherical earth. It should be noted that even though not all geocentrists are flat-earthers invariably all flat-earthers seem to be geocentrists. It seems the author of the Qur'an thought that the sun (and the moon and the five known planets) followed a curved (rounded) course (a Falak). According to the Qur'an this falak starts in the east (where the sun goes up), goes high above the earth and ends after sunset with the Sun resting at night at a hidden place. All this took place around an earth that was spread out and had a firmament built on invisible pillars above it. This was a common belief at the time and can be found with the Babylonians, ancient Hebrews, the Assyrians and other cultures in the region. In that regard it may be interesting to note that the Tawaf (the circling of the Ka'aba) mimics these seven orbits. Please note that this article is meant in no way to disrespect the people of that age and time. These people described the universe as best they could using the available tools and knowledge they had at their disposal. The evidence for the Qur'an’s geocentricity will be dealt with in several paragraphs, supported by evidence from the Qur'an, Muslim daily practice, Muslim scientists and the Hadith. Even though some Muslims reject the Hadith and the Sunnah as being not-divinely inspired; that argument presupposes a priori that the Qur'an is divinely inspired and protected whilst these other documents are not. Obviously, such special pleading will not do in a scholarly examination of the Qur'an. The Qur'an alone cannot prove itself to be Muhammad’s words (let alone the words of Allah) without the support of hadiths. Not only are these sources useful as supporting evidence; they also tell us which interpretation is supported by Muhammad and (early) Muslims. This is also why this article includes the views of several medieval Muslim Astronomers: if the Qur'an had clearly described a cosmology that is not geocentric, they would simply not hold geocentric views. In addition, we will even include the opinions of a modern-day Muslim astronomer. There is only one moon and one sun in the entire Qur'anic universe. The position of all these celestial bodies within this universe are clearly described in the Qur'an. For example, the heavens are above the earth, and the sun and the moon are within the heavens, and the earth and the stars are below the lowest heaven to beautify it. The Qur'an mentions heavenly bodies traveling in their own orbits, but so do the concepts of day and night. None of the bodies are supposed to run into each other. The heavens are firmly held in place lest they move from where they are and fall on the earth. Note that there is no mention of orbits for the heavens or the earth in the Qur'an. An orbit is only mentioned for the sun and the moon. Not even the stars have an orbit, for they are as if hanging down from the heavens like a light bulb from the ceiling in a room. The fixed position of the heavens, earth and the stars, as well as the moving sun and moon in between them, means what? For the Qur'an to be scientific, it must contain accurate statements in regards to all that is visible i.e. material objects and phenomena. How can Allah appeal to such things as proof of his power and existence if he fails to make his case obvious? A confusing text is no proof of anything other than foolishness, ignorance, weakness or imperfection. If the Qur'an tells us the heavens and the earth are firmly held it their places, what are we to make of this? Why does the Qur'an not mention the same for the sun and the moon i.e. that they too are firmly held in their places? Instead the Qur'an indicates they are keeping strictly to their courses. All the evidence in the Qur'an points very strongly to the fact that the author had been observing the universe, not from the heavens, but from the Arabian Desert. The author tells us that the heavens are above the earth. Why? Because he was looking at the heavens from the Arabian floor and not from the vast space above or below. Otherwise Allah would have seen the Milky Way as a disc. Our solar system too is a disc. The earth is just one of the planets moving around the sun. However, in the the Qur'an we find the sky mistakenly being referred to as if it were a solid structure that could fall upon the earth and crush people and things between them. There are verses upon verses which lead us to these conclusions. According to the Qur'an, the sun and the moon are some of the signs (al ayaat) that are created by Allah. In the Qur'an, Allah also promises to "explain his signs in detail, for people who have knowledge." It is He Who made the sun a shining thing and the moon as a light and measured out its (their) stages, that you might know the number of years and the reckoning. Allāh did not create this but in truth. He explains the signs in detail for people who have knowledge. yussuf Ali - (he explains in detail) al ayaat (the signs) Li (for) Qawmin (people) Yalamoon (knowing). Muslims apologist may say that these detailed explanation are only correctly understood by them (since only they have knowledge); but this is of course circular reasoning. ("You first have to believe the Qur'an to be 100% true to be qualified to criticize its veracity.") Even if this were true, these Muslim possessors of 'true' knowledge should be able to provide us with a coherent, unambiguous explanation of the Qur'an and its miraculous signs - and if we look at how early learned Muslims, including Muhammad himself, explained these verses, we will find that they confirm a geocentric cosmology. The sun and moon running their courses are signs (ayaat) to mankind and thus they must be visible (or known) to a 7th century Arab audience. The Qur'an also promises to explain these signs in detail. And with good reason because they are proofs for the people so they can be certain that someday they will meet Allah. The movement of the sun (as well as the course of the moon) is visible according the author of the Qur'an. These were all visible phenomena to the people of the 7th century; they could 'see' the night turn into day and vise versa, they could see the sun and the moon run their courses around the earth. The people could see Allah's signs, and Allah could see them. At various places in the Qur'an numerous observers 'see' the sun go up, reach its highest point, then go back down to its resting place. It could be argued that "don't you see" means "don't you know" or "aren't you aware" or "don't you realise". Of course this does not make much of a difference. In this case, the Qur'an clearly reinforces the common but incorrect beliefs of the time, and further uses these erroneous beliefs to support the existence of Allah. Have you not seen see how your Lord spread the shadow. If He willed he could make it stationary. Then do We make the sun its guide. According to the Qur'an, the shadow that the sun casts are moving because of the sun. And we should be able to see this. Of course, this is exactly how it would appear to someone observing the phenomena standing here on earth; however, this is not how you would describe it if you were viewing from outside our solar system. It is not the sun but the rotation of earth which causes shadows to change shape. Interestingly, the length of the shadow cast by the sun is also used to determine the start of the Asr prayer time; the apparent movement of the sun is still used by Muslims as a clock of sorts. However, according to a better English translation of the Qur'an, the sun's influence over the shadow is only part of the hypothetical situation in which Allah makes the shadow constant. In such a case, indeed, the earth's influence over the shadow's length becomes naught (since it only arises if the earth stops moving), and the sun's influence becomes singular. And again: the Qur'an explains, not only are humans created in pairs (male and female), so are the two bodies of flowing waters (one salt and one sweet), and the night and the day and the sun and the moon. […]1 And Allah did create you from dust; then from a sperm-drop; then He made you in pairs. And no female conceives, or lays down (her load), but with His knowledge. Nor is a man long-lived granted length of days, nor is a part cut off from his life, but is in a Decree (ordained). All this is easy to Allah. Nor are the two bodies of flowing water alike,- the one palatable, sweet, and pleasant to drink, and the other, salt and bitter. Yet from each (kind of water) do ye eat flesh fresh and tender, and ye extract ornaments to wear; and thou seest the ships therein that plough the waves, that ye may seek (thus) of the Bounty of Allah that ye may be grateful. He merges Night into Day, and he merges Day into Night, and he has subjected the sun and the moon (to his Law): each one runs its course for a term appointed. Such is Allah your Lord: to Him belongs all Dominion. Notice how frequently the sun and the moon are mentioned together as a pair. Its clearly implied that the sun and the moon are a pair of sorts, just like (according to the Qur'an) the heavens and the earth or the night and the day. In Qur'an 36:36 and 35:11-35:13 this belief is expressly stated. The sun and the moon (along with their courses) are mentioned amongst a range of other things that are created in pairs. According to the Qur'an, the sun's cycle is repeated on a regular basis (exactly computed even) just like that of the Moon and night and day. Seest thou not that Allah merges night into day and he merges day into night and he has subjected the sun, and the moon each running its course for a term appointed. And Allah is aware of what you do. This Surah reads: Alshamsu (the sun) waalqamaru (and the moon) bihusbanin. Husban can mean a number of things: definite reckoning, appointed courses, numbering, revolving firmament, running appointed and scheduled course. In many English translations we see the word 'course' or 'celestial sphere' but note that the word 'falak' isn't mentioned here; this verse only indicates that the sun and the moon behave in a calculated / scheduled / appointed manner. There is a reason why this is important: the sun's daily cycle and the moons monthly cycle are used for timekeeping in Islam. A token unto them is night. We strip it of the day, and lo! they are in darkness and the sun runneth on unto a resting-place for him. That is the measuring of the Mighty, the Wise. And for the moon We have appointed mansions till she return like an old shrivelled palm-leaf. The Qur'an clearly tells us that the sun follows a daily cycle, which ends every night when the sun goes to its resting place. (ِمُسْتَقَرٍّ) Waalshshamsu (and the sun) tajree (runs) limustaqarrin (a resting point) laha (of it). It is He Who made the Sun to be a shining glory and the moon to be a light (of beauty), and measured out stages for her; that ye might know the number of years and the count [of time]. Nowise did Allah create this but in truth and righteousness. (Thus) doth He explain His Signs in detail, for those who have knowledge. And We have made the night and the day two signs, then We have made the sign of the night to pass away and We have made the sign of the day manifest, so that you may seek grace from your Lord, and that you might know the numbering of years and the reckoning; and We have explained everything with distinctness. The moon (the sign of the night) is to be used to count the years (12 lunar years make up the Islamic year) and the sun is to be used to keep track of time. The only solar movement Muslims use for timekeeping is the apparent daily course of the Sun (from east up and then down to the west). To this very day, Muslims use the (crude) lunar calender, and the waqt (prescribed time) of their daily salats (prayers) is determined entirely by the position of the Sun along it’s apparent course. Salat Al Zuhr – right after the Sun’s zenith, but before the shadow of the Sun becomes twice its length from midday. Salat Al Isha'a – between sunset and sunrise. The picture is pretty clear: the apparent daily course of the sun dictates the time of each and every daily prayer. And this is important for Muslims. [...]' prayers are enjoined on believers at stated times. Establish worship at the going down of the Sun until the dark of night, and (the recital of) the Qur'an at dawn. Lo! (the recital of) the Qur'an at dawn is ever witnessed. The Qur'an is clear; the apparent course of the sun is to be used for timekeeping ('reckoning') and the only examples of the sun being used for timekeeping in the Qur'an employs the sun's daily movement along the sky. Take a look at these verses which explain to us the shape of the sun's course. Apparently the sun goes up from east, travels high and eventually goes down to the west. […] and let the people assemble when the sun has risen high. Here the course of the sun is described as a sign (ayat). Note that the rising of the sun is compared (again) to the rising of the moon (the same words are used). However, the moon is in an orbit around the earth, whilst the sun is not. Thou wouldst have seen the sun, when it rose, declining to the right from their Cave, and when it set, turning away from them to the left, while they lay in the open space in the midst of the Cave. Such are among the Signs of Allah: He whom Allah, guides is rightly guided; but he whom Allah leaves to stray. The Qur'an clearly tells the sun ends its daily cycle every night when the sun goes to its resting place. (ِمُسْتَقَرٍّ or musttaqar). And a Sign for them is the night: We withdraw therefrom the day, and behold they are plunged in darkness. A token unto them is night. And the sun runs his course for a period determined for him: that is the decree of (Him), the Exalted in Might, the All-Knowing. And the sun runneth on unto a resting-place for him. Lo! We made him strong in the land and gave him unto every thing a road. And he followed a road. Till, when he reached the setting-place of the sun, he found it setting in a muddy spring, and found a people thereabout. We said: O Dhu'l-Qarneyn! Either punish or show them kindness. Then he followed a road. Till, when he reached the rising-place of the sun, he found it rising on a people for whom We had appointed no shelter therefrom. The place where the sun goes down has a name 'Mahgreb' (from the root ghuroob, meaning "to set" or "to be hidden"). Today, North-Western Africa (Morocco in particular) is denoted by this very name. Interestingly, if one stands there and looks at the ocean at sunset one could 'observe' the sun going to its hidden resting place. The Qur'an is quite clear about the course of the sun. It does not even describe a complete orbit, but merely a rounded course (falak) that has a beginning, an end, and a highest point. Muslims living in Muhammad’s day unequivocally accepted the Qur'an's geocentric cosmology. References in the Hadith of any of the ansari or others in Muhammad's environment arguing about this point with their prophet or amongst themselves are unknown. Famous Muslim astronomers (people who certainly read, and knew the Qur'an) like the Arab astronomer Ibn al-Shatir and the Persian Nasir al-Din al-Tusi used Greek (geocentric) astronomy to create complex models of our ‘universe’ (basically only our solar system, which they believed constituted the entire universe) that were geocentric just like the Qur'an. The sun circles the Earth because it is smaller than the Earth, as is evident in Koranic verses. Have you ever seen how the sun moves? I have seen the sun moving. The sun makes one move every 24 hours. What I say is based on Koranic science. He bases his arguments on the kind of science that I reject categorically -- the modern science that they teach in schools. This science is a heretic innovation that has no confirmation in the Koran. No verse in the Koran indicates that the Earth is round or that it rotates. Anything that has no indication in the Koran is false. According to Fadhel Al-Sa'd, the moon's diameter is 1,200,000 km, while that of the sun is only 2,400,000 km. In the Hadiths we read Muhammad's own words, and they clearly paint the same picture: the sun moves around the earth and goes to a resting place at night. Narrated Abu Dharr: The Prophet asked me at sunset, "Do you know where the sun goes (at the time of sunset)?" I replied, "Allah and His Apostle know better." He said, "It goes (i.e. travels) till it prostrates Itself underneath the Throne and takes the permission to rise again, and it is permitted and then (a time will come when) it will be about to prostrate itself but its prostration will not be accepted, and it will ask permission to go on its course but it will not be permitted, but it will be ordered to return whence it has come and so it will rise in the west. And that is the interpretation of the Statement of Allah: ‘And the sun Runs its fixed course for a term (decreed). That is The Decree of (Allah) The Exalted in Might, The All-Knowing.’"
Narrated Abu Dharr: I entered the mosque while Allah's Apostle was sitting there. When the sun had set, the Prophet said, "O Abu Dharr! Do you know where this (sun) goes?" I said, "Allah and His Apostle know best." He said, "It goes and asks permission to prostrate, and it is allowed, and (one day) it, as if being ordered to return whence it came, then it will rise from the west." Then the Prophet recited, "That: ‘And the sun runs on its fixed course (for a term decreed),"
Even though these Hadiths are all deemed 'sahih' (authentic) according to Islamic scholars, some Muslims will deny them without any valid reason other than for their stupidity. Of course the Hadiths, at the very least, tell us what Muslims around the time of Muhammad (or not long after his demise) believed about the sun and how to interpret the Qur'an correctly. A lot of details about the sun’s movement are contained within the Qur'an. is (almost always) compared to the Moon's course. is to be used by the Muslims for timekeeping. has a destination. Beginning in the east, it goes up to a high point, then goes down to the west. What else can one conclude, other than the Qur'an is geocentric? Whoever wrote the Qur'an thought that the sun orbits our planet. We know this is not true: the sun is not orbiting our planet and it is certainly not in some bizarre daily rounded path that looks like half a circle. In ancient times, many people - but certainly not all - did not know any better than what they seemed to observe everyday: the sun appeared to be going around the earth through our skies. We cannot blame a 7th century Bedouin for not knowing this, but should not the omnipresent, omnipotent, omniscient creator of the universe know better? Geocentric Islam - Muslim blog, "western atheists deceived us when they taught the Hoax of a Rotating Earth !!"